Giorgio and Rachel Alessio's convivial town-centre restaurant has become a much-loved fixture of the Scarborough scene since opening in 1999. It is a relaxed kind of place comprising two intimate dining rooms that are run with great personal attention and care (witness the framed testimonials from satisfied customers covering the walls). The white truffle of Piedmont is given a starring seasonal role, and imports from Moncalvo find their way into risottos, pasta dishes, sauces and much more besides. This is a restaurant that depends on artisan Italian provisions supplemented by fish procured direct from Scarborough market. The result is a repertoire that might include steamed Monferrato salame with Val d'Aosta cheese fondue and black truffles, red mullet stew and grilled halibut with broccoli frittata and peperonata, as well as old faithfuls like sirloin steak with wild mushrooms and Barolo sauce. To finish, Giorgio's sweet nettle pudding has acquired near-legendary status - otherwise try York Minster Pale Ale ice cream or zabaglione 'a la lampada'. The wine list is a serious oenophile's tour around the Italian regions, with special attention paid to directly imported Piedmontese bottles (including Barolo dating back to 1990). We have a wide selection of local fish, caught daily and personally selected from the Harbour in Scarborough every morning. The Truffle is an underground mushroom and is dug out of the ground by specially trained dogs.The distinct flavour of the White Truffle (Tuber Magnatum Pico) lends itself to the fact that it is grown underground at the root of certain trees. Northern Italy is the main area in which the Tartufi Bianchi are found. They are one of the most expensive spices in the world. For this reason, only shavings are needed to be used in cooking. Truffles, like other fresh foods are seasonal and are only available between October and December-January. We only serve beef sourced locally from farms nearby, traditionally fed and reared on home-grown feed. The traditional breed of Aberdeen Angus crossed with Limousin is used to provide consistent quality. Medallions of fillet steak pan-fried with butter and garlic. Served rare. Typical Northern Italian rum flavoured sweet. A cold dessert literally translated 'cooked cream'. All the specials contain seasonal ingredients and are subject to availability. As explained in the main menu the White Truffle Dishes are all available in season - between October - December/January. 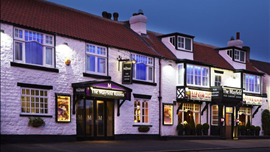 The Mayfield situated in the pretty Yorkshire village of Seamer, a few miles south-west of Scarborough has been given a new lease of life by the same team behind the award winning nearby Copper Horse. 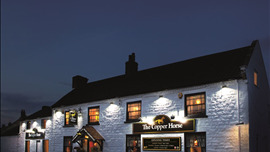 The Copper Horse is an award winning restaurant situated in the pretty village of Seamer, just outside Scarborough on the North Yorkshire coast.